Sterling conducts all of its testing, service and repairs of vertical, horizontal split case, submersible, turbine pumps and motors at its facility in Pakenham, in the outer south eastern suburbs of Melbourne. Sterling is also able to dispatch qualified engineers for site inspections and commissioning as well as emergency repairs. We have staff who have BOSIET and HUET certification for offshore platform work. A complete range of spare parts is maintained onsite to ensure that repair times can be kept to a minimum. We understand the importance of limiting costly downtime to our clients in oil, gas, fire-fighting, process and mining industries, among others. Our facility combines a 10-tonne lifting capability and a multifunctional wet test area, with a team of highly experienced and qualified engineers, motor winders, machinists, fitters and welding staff. Sterling repair all pump brands, and can reproduce components at our on-site machine shop as needed. 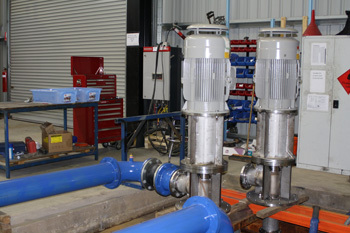 Sterling’s testing facility can handle most large capacity industrial pumps. All products manufactured at our facility undergo rigorous testing to ensure they will perform reliably as intended.